Diving at fresh and salt water dive sites around Canada. If you become interested in scuba diving in Canada and you will find it offers some of the most extraordinary dive sites in the world. It is not the first country you think of when joining the scuba diving community, but it has become the number one shipwreck dive destinations in the world with many Canada hotels now offering vacation packages which include scuba diving tours. The equipment necessary for scuba diving here is a dry suit or 8mm wetsuit, as water temperatures range between zero and ten degrees Celsius. For the real pro’s, ice diving is also available in the northern parts of the country during the winter season. Canadian holidays offer something special. Canada is not only beautiful in itself, but with some of the spectacular mountain ranges, which include the Rocky Mountains and Mount Robson, along with brilliant rivers and fantastic crystal clear lakes. Wildlife is abundant in remote Canada with a lot of space and national parks for mammals and birds. Some of the best known places for diving in Canada are found around the Great Lakes with its graveyards of shipwrecks. Transport by ship was number one during the golden age as trucks were not yet readily available and the development of steam trains had just begun. Lake Ontario is the smallest and most Western lake in Central Canada. With huge lakeside cities as Hamilton and Toronto, dive shops are well available. Famous spots include Kingston and the dive sites around Prince Edward County. Just North of Lake Ontario is the Saint Lawrence River which is the largest river that connects the Atlantic Ocean with the Great Lakes. This passage has resulted in many wrecks along the way. Lake Erie, just below Lake Ontario has a wide variety of shipwrecks available. Scuba diving is well established near Long Point and Point Pelee. Lake Huron connected with the Georgian Bay and North Channel has quite a few underwater preserves where they have all kinds of regulation to preserve the lake. This results in very good and well maintained dive sites at shipwrecks. With smaller cities such as Cheboygan and Tobermory this lake is much less crowded and travelled on than neighbouring lakes Lake Michigan, Lake Erie and Lake Ontario. Lake Superior is the largest lake of the Great Lakes with a surface area of more than 80.000 square meters which equals for example the state of South Carolina and the country of Austria, Europe. The most remote lake as well with settlements as Sault Ste Marie for dive sites around Whitefish Point and Thunderbay (Ontario) for dive sites around Isle Royale. Other famous regions are near Vancouver and Seattle (Puget Sound), where a lot of fresh and salt water diving is available in its vast system of rivers. 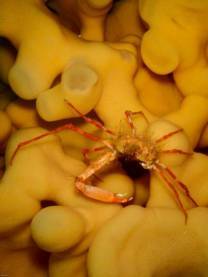 Other dive sites in Canada are spread out over the country, from British Columbia to Nova Scotia. Enjoy this paradise of dive sites. Whether it is sweet or salt water, whether it are cave dives, wreck dives or natural rock formations, you will have a good time here. Remember though, all dives are going to be cold.